Got a new Apple Watch? Congratulations! It's fun and useful, but you can't just take it out of the box, put it on your wrist, and start using it. You need to set it up first. This article offers step-by-step instructions on how to set up your new Apple Watch, plus tips on how to use it and solve common problems. Let's get started! This article applies to all Apple Watch models (including cellular models) running watchOS 5 and higher. Setting up an Apple Watch consists of two parts (we'll cover both): Pairing the watch with your iPhone and then either 1) Using it as a new watch or 2) restoring the data from a previous Apple Watch. An iPhone 5S or newer (iPhone 6 or newer for cellular Apple Watch models), with the Watch app installed. The app comes pre-installed on all recent versions of the iOS. Bluetooth enabled on your iPhone. Your iPhone connected to a Wi-Fi network. While the Apple Watch can do many things on its own, it gets much of its functionality from being connected to an iPhone in a process called pairing. With those requirements met, follow these steps to set up your Apple Watch and pair it to your iPhone. Turn on your Apple Watch by pressing and holding the side button on the Watch until the Apple logo appears. When the logo appears, let go of the button. Move the iPhone and Apple Watch close to each other. Since pairing an Apple Watch to an iPhone uses Bluetooth, the devices must be near each other for the connection to work. On your iPhone, open the Apple Watch app and tap Start Pairing. Almost all of the instructions in the rest of this article refer to actions you take in the Watch app on the iPhone. When the iPhone and Apple Watch detect each other, a swirling animation appears on the Apple Watch screen. A frame appears on the iPhone screen. Move the iPhone so that the Apple Watch appears in the frame on the iPhone. When the iPhone "locks" onto the Watch, you'll move automatically to the next step. In some rare cases, the iPhone and Apple Watch may not be able to connect in this step. If you run into this issue, tap Pair Apple Watch Manually on the iPhone and follow the onscreen prompts to pair the devices. When your iPhone and Apple Watch are paired, you can choose to Restore from Backup or Set Up as New Apple Watch. If you've had an Apple Watch in the past and want to use the data from that, choose Restore. Otherwise, choose Set Up as New. Continue on to one of the next two sections of this article, based on your choice in the last step. If you haven't had an Apple Watch before, or don't want to restore from a backup, this is the option for you. Here's what to do:. For this option, you need to have followed the steps from the first section of this article. There's not much to do on the first few screens after choosing to set up a new Watch. Agree to Apple's terms and conditions, wait for the Watch app to sign you into your Apple ID account (if you're prompted to sign in, do so), and then tap OK on the Shared Settings screen. You may get prompted to log into your Apple ID if you bought a used Apple Watch. In that case, the Watch may still be tied to the seller's Apple ID. If so, you won't be able to proceed until removing Activation Lock. Learn more about this in How to Unlock iCloud-Locked iPhones (the tips apply to Apple Watch, too). Next, you can create a passcode to secure your Apple Watch. This is just like the passcode on your iPhone. To use a basic, 4-digit code, tap Create a Passcode and enter your preferred code twice on the Apple Watch. To use a more complex and secure code, tap Add a Long Passcode and enter the code on the Watch. You can also choose Don't Add Passcode, but we recommend against that. The Watch app on the iPhone then lets you know about the Heart Health features of the Apple Watch, for models that support them. There's nothing to do on this screen other than tap Continue. All of the heart health features are used only on the Watch, after set up. The Apple Watch supports Apple Pay for easy, secure wireless payments. If you already use Apple Pay on your iPhone, you'll just need to re-authorize your card. If you don't use it yet, you can set it up in this step. Either choose Continue to set up Apple Pay or Set Up Later in the Apple Watch App. For more in-depth information about the Apple Watch and Apple Pay, check out How to Use Apple Pay On the Apple Watch. The next screen explains the safety features of the Apple Watch (the exact options differ based on the model, but they include Emergency SOS calls and fall detection). To enable Fall Detection, go to the Watch app on iPhone, then select My Watch > Emergency SOS > move Fall Detection to on/green. Your Watch inherits many settings from your iPhone. If you've already set up things like emergency contacts and health and activity goals, those settings will be automatically added to your Watch. If not, you may be prompted to set them up here. If your Apple Watch supports cellular connectivity, you can configure cellular service at this point. Tap Set Up Cellular. This brings you to a set-up process for the phone company providing cellular service for your Watch. Follow the onscreen prompts until you return to a screen that says Cellular Is Ready. Tap Continue. You can install Apple Watch apps that give you mini-versions of iPhone apps right on your wrist. On this screen, you can choose to either Install All Watch apps available on your iPhone or Choose Later. If you want to start using your Watch right away, it's probably better to do this later. Installing apps on the Watch can be slow and if you choose to install all available apps, it could be quite a while before your Watch is ready. With all of your settings selected, your iPhone and Apple Watch will begin to sync. How long this takes depends on how much content you're syncing, but expect it to take at least a few minutes. Check the progress wheel on both the iPhone and Watch for status. A noise will play to let you know when the process if complete. While you wait, you can learn more about the Watch by swiping up on its screen and tapping tutorials. When the sound and vibration let you know that syncing is done, press the Watch's Digital Crown to start using it. If you have had an Apple Watch in the past and want to move the data from that Watch to your new model, this is the option for you. Just follow these steps. You need to have followed the steps from the first section of this article before starting these instructions. First, choose which backup you want to restore onto your new Apple Watch. The Watch app on the iPhone will show you all of the available backups. Just tap the one you want. The first few screens after choosing a backup are pretty quick. Agree to Apple's terms and conditions, sign into your Apple ID (this should happen automatically, but sign into if you're asked). Tap OK on the Shared Settings screen to continue. Next, create a passcode. Tap Create a Passcode to use a simple, 4-digit code to secure your Watch. Enter the code you want twice on the Watch. Tap Add a Long Passcode to use a more complex code, or tap Don't Add Passcode to skip it entirely (but that's not a good security habit and we don't recommend it). If your Apple Watch supports Heart Health features, the next screen details them. There's nothing to do here except read about the features and then tap Continue. You can add Apple Pay to your Watch, if you want. Either tap Continue to set up Apple Pay or Set Up Later in the Apple Watch App to do it later. 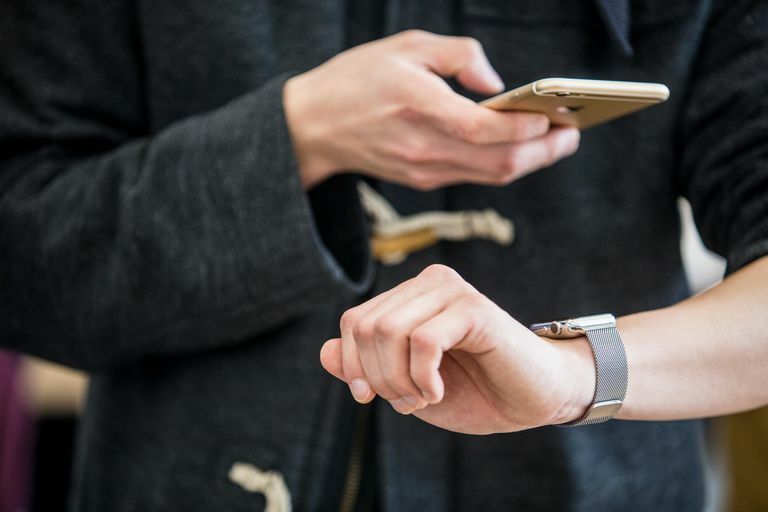 At this point, your iPhone and Apple Watch start syncing. This will take anywhere for a minute or two to much longer, depending on how much data is being synced. A wheel displays progress on both the iPhone and Watch. A noise plays and the Watch vibrates to let you know that syncing is finished and that you can start using your Watch. Just press the Digital Crown. Using Apple Watch. For a good overview of basic functionality and uses of the Watch, check out Apple Watch 101 For The New Apple Watch Owner. Getting Apps. To learn how to expand the Watch's functionality by adding new apps, read How to Add Apps to Your Apple Watch. Using Important Apps. Want to learn more about using some favorite apps on the Watch? Read How to Use Spotify On Apple Watch and How to Use Facebook on Apple Watch. Updating watchOS. Just like with the iOS on iPhone, Apple regularly releases new versions of watchOS for the Apple Watch. These updates fix bugs and add new features. Learn how to install them in How to Update Your Apple Watch. Key Watch Accessories. You need more than just the Watch itself for the best experience. Check out our suggestions for Our Favorite Apple Watch Accessories. Sometimes things go wrong with the Apple Watch and, when they do, you need to know how to fix them. Check out this collection of troubleshooting articles. Restarting Apple Watch. Just like with the iPhone, sometimes problems can be fixed just by restarting the Watch. Learn how in How to Restart Apple Watch. Find a Lost Apple Watch. The same technology used for Find My iPhone helps you find a lost or stolen Apple Watch, too. Find out how in How to Find My Apple Watch. Apple Watch Won't Turn On? If your Apple Watch just won't turn on, you need the tips in How to Fix an Apple Watch That Won't Turn On. Unpairing Apple Watch and iPhone. If you're upgrading to a new Watch model or need to take some advanced troubleshooting steps, you may need to unpair your Watch and iPhone. Find out how in How to Unpair Apple Watch and iPhone.